At the ConnectGov 2016 summit, held in Thimpu, Bhutan on 25-26 July, a powerful panel of experts and CIOs discussed ways to increase the value of ICT for smart cities in the Asia Pacific region. The participants of the “Increasing the value of ICT for Smart Cities” panel included Asam Khan (COO, Exponent Technology Services), Dr. Suhazimah binti Dzazali (Deputy Director General, ICT, MAMPU, Government CIO, Malaysia), Setiaji (Head of Jakarta Smart City, Jakarta Provincial Government), Siew Yim Cheng (CIO, JTC Corporation), and Dirk-Peter van Leeuwen (Sr. VP & GM, APAC, Red Hat). The discussion was moderated by Randeep Sudan (Advisor, Digital Strategy and Government Analytics, World Bank). What is the government’s role is building smart cities? What new technologies are governments in Asia using to deliver citizen services? Has the time come for the deployment of drones and robots in smart city environments? And is Open Source ready as a platform to support smart city technologies? A powerful panel of experts and government CIOs discussed issues like these in a panel discussion “Ways to increase the value of ICT for smart cities” at the ConnectGov 2016 Summit in Bhutan. 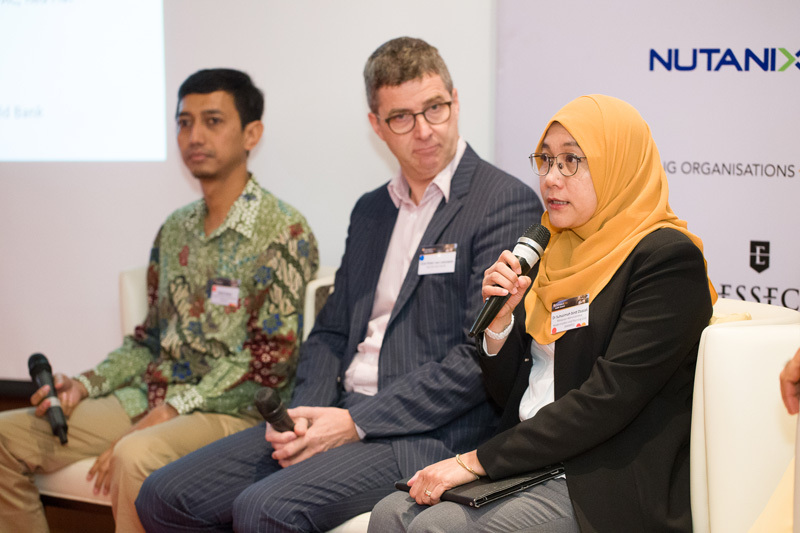 Setiaji, Head of Jakarta Smart City, explained in detail the motivations behind launching the smart city drive in Jakarta and how the project has shaped up so far. Jakarta is divided into five cities, one district, 44 sub-districts, and 267 villages. It is home to 10 million people. During the day, an additional 1.4 million people commute to work. Such a complex and highly populated city throws up its own challenges: clogged drains, unattended garbage, broken street lamps, damaged roads, and occasional floods. On top of that, Jakarta is infamous for its crawling traffic. Setiaji said that the idea behind developing Jakarta as a smart city was to make Jakarta more innovative, to make the government more transparent, engage citizens and collaborate with young people (citizens) to develop apps to solve local problems and improve the quality of life for its citizens. He mentioned citizen engagement tools such as Qlue and CROP that have been successful. Since Jakartans loves to get engaged with apps and social media tools, the government deployed apps to enhance its citizen services. Qlue was launched in December 2014 with the aim to accommodate citizen complaints. The app allows citizens to upload photos and report problems that occur in their neighborhood. Another app, CROP (Cepat Respon Opini Publik) is used by the government to respond to the complaints. The Qlue app is very easy to use, and it only takes five minute to report a problem. Currently 200,000 Jakartans use Qlue. An average of 5,000 reports are filed each day. These apps have made a remarkable difference to the lives of citizens, said Setiaji. They have quickened the pace of service delivery. For example, earlier, a complaint of garbage clearance would take up to three days to be addressed. Now, it gets done in 20 minutes. Similarly, government has been able to save money in electricity costs by using smart lighting systems. Big data also plays a big role in smart city solutions. Setiaji said that the government is using data analysis in a big way to solve the city’s problems. By crowdsourcing data, the government is trying to solve issues like traffic jams on the city’s roads. 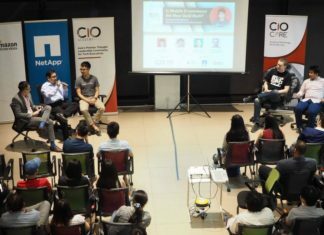 To encourage citizen participation in government’s efforts, hackathons are organised from time to time and co-working space have been provided to citizens. Jakarta city is now preparing for the Asian Games 2018. To enhance security in the city, the government is installing city surveillance systems and face recognition systems. Complementing Setiajia, Dr. Suhazimah binti Dzazali, Deputy Director General, ICT, MAMPU, Government CIO, Malaysia, said that at the end of the day, all ICT policymaking is about serving the humankind. From the smart city perspective, building smart cities is about using data to serve citizens better, building ICT infrastructure and using technology to deliver services such as healthcare, she said. Dr. Suhazimah made a special mention of Malaysia’s 11th National Plan. The Plan’s Chapter 7 outlines strengthening infrastructure for smart cities in the country. This includes solving many pain points in the urban dwellings—congestions, pollution, and inadequate distribution of services. 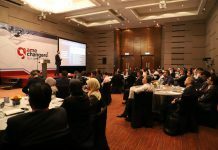 According to her, Malaysia’s ICT Plan 2020 aims to achieve consolidation in digital services at the governmental level. The Plan envisages data-driven smart cities, implementation of IoT, Open data implementation and capability development. She said that for Malaysian authorities, the National IoT strategic roadmap provides a reference point for smart city development. She cited the example of Putrajaya, which is being developed as Smart Putrajaya. The city is being equipped with smart traffic light technology, smart building management solutions, and lights management technology. She said that JTC does e-planning to manage a scare resource like land and in designing and building industrial units, which spreads over 1 million sqm of Gross Floor Area. All the land under JTC is on a geospatial map to facilitate planning , building and maintenance activities. Giving examples of the deployment of new technology, she said that JTC is already using robots in maintaining the estates. Use cases of IoT can be seen in estate development through installed sensors in JTC buildings. These sensors also help in detecting improvement opportunities in the buildings. Fusionopolis and Biopolis are examples where sensors were installed a year ago. These have helped in halving the utility bills, said Cheng. Similarly, the sensors capture 5 million data points everyday in two Jurong buildings owned by JTC. This data helps in detecting if the building equipment is being used properly. Cheng said that all these new technologies such as e-mapping, IoT and big data have resulted in dollar savings and time savings for JTC. They ensure that there is less downtime for the tenants. Looking forward, she said that JTC is looking at ‘Drone as a service’, deployment of video analytics for physical security and media analytics for traffic control. Asim Khan, COO, Exponent Technology Service, Dubai, talked about his experience of working with the government of Dubai for the use of drones in the urban environment. Khan’s company provides drone solutions to the government and commercial sectors in the Middle East. Khan has been providing drone solutions to the Dubai authorities in ports, transportation, and electricity sectors. His company is using drones for precision agriculture, and inspection of power lines and solar panels, among other uses. Khan said he helped in this education phase of the Dubai government and private citizens, which was not helped by airspace breach incidents by drones. He cited the example of one such incident in June this year, which led to Dubai airspace being shut off for 69 minutes because of a wandering drone. Air traffic was brought to a standstill for more than an hour at Dubai International Airport, following the presence of an unauthorised drone in the airspace. This was the second time such an incident had happened in less than two years in Dubai. The incident may have cost Dubai close to $69 million—loss of $1 million per minute. In January 2015, a similar incident (public misuse of recreational drones) had brought air traffic to a standstill for 55 minutes at Dubai Airport. Concluding his talk, Khan said that information is key as information drives decisions. “The quality of those decisions will determine whether drones are useful enough to be integrated into the national airspace,” he said. In his remarks, Dirk-Peter van Leeuwen, Sr. VP & GM, APAC, Red Hat, highlighted Open Source as a suitable platform for smart city technologies. Enumerating the benefits of open source, Dirk said that open source prevents governments from getting into vendor lock-ins. He urged that governments should consider developing an ‘open source reference implementation for smart cities’. So far, this has not been done. Dirk highlighted the necessity of having open data, that could lead to more collaborations. 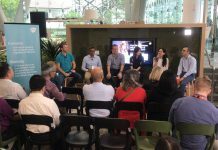 For example, he said, in the healthcare space, patients are more aware now and healthcare professionals and hospitals have to take this new patient behaviour into consideration. Well-informed patients are demanding access to their own data. Interestingly, sharing of data among patients is emerging as a movement, he said observed. For instance, the OpenNotes Society in the USA encourages ill people to share their data (for better research outcomes), and 7 million patients are already participating in it. According to the OpenNotes website, up to 92% of patients in the OpenNotes study opened their notes. More than 60% of patients reported doing better with taking medications as prescribed because of open notes. More than 77% of patients reported that open notes helped them feel more in control of their care. OpenNotes also has the potential to help patients stay healthy or better manage chronic conditions, such as asthma or diabetes, help patients prevent medical errors, reduce healthcare costs through better communication, medication adherence, and more efficient use of a clinician’s time. 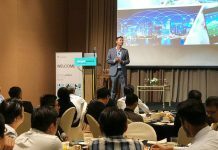 “It is time you put open source and collaboration on the forefront of your decision-making,” Dirk said, addressing the CIOs and business leaders at the Summit. Next articleThe wave of disruption spares no one, it’s time to get your surfboards ready!